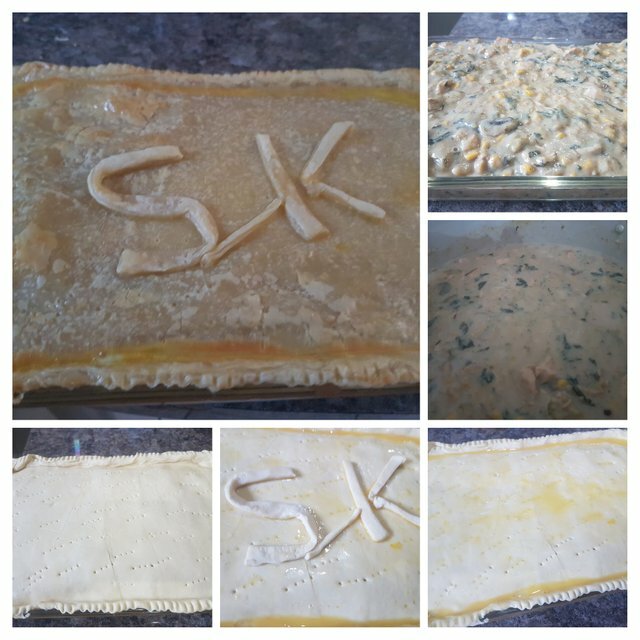 SteemKitchen Contest #1 - Cheap and Cheerful - Chicken,Mushroom and Spinach Pie. Growing up as a youngster I fondly remember my grandma making us chicken pie when we visited. 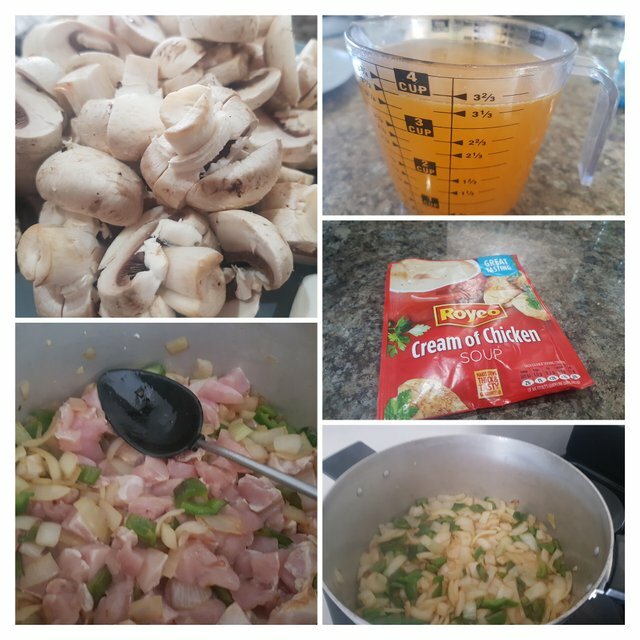 I love to make this recipe as it keeps well in the freezer and I can make a nice big pie and then have some at a later stage when to busy to cook. 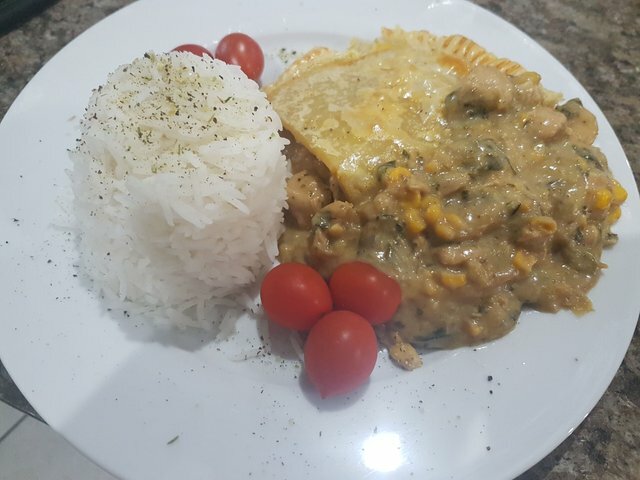 I cant believe chicken pie to be totally local in origin but it sure has become a local dish in many South African Homes. Sadly I don't have my my grannies recipe but have found a method that works for me and can so easily be adapted to any taste or flavor. The whole meals cost came to $ 14.89 with 6 portions the Cost Per Meal came to $ 2.48. Here in South Africa that is roughly R 37.00 Per portion in our local Currency. Add the Chicken to the onions when ready and give a good stir. Brown the chicken and add the mushrooms, veggies, spinach and chicken stock. Bring to a boil and reduce heat to a simmer for 30 min. Mix the soup powder with 3/4 of the water indicated and add to pot. Let simmer until you get a nice pie filling consistency. Cover the filling with the pastry. Take a fork and prick randomly. Brush on some whisked egg. Place in oven for 20 to 30 minutes until the pastry is done, checking often until a golden brown color appears. Serving Suggestion : Serve with some longrain rice and or a fresh garden salad. I thoroughly enjoy making this dish and more so having it on the plate for a meal. Its real simple to prepare and goes a long way for a contract worker or bachelor away from home with only one pot and a oven dish required. Click banner above to go to SteemKitchen's latest Contest Released this week. We are looking forward to a wonderful selection. With a puff pastry crust! I have gone to Heaven! Did someone say comfort food? Oh, that looks good. I do miss chicken pot pie (what my granny called it). I am allergic to gluten so I have yet to find a substitute for wheat flour so pastry tops are out. By the way, I saw you were at the Curation Corner I was interviewed at and really wanted to say thank you for being so supportive of it. Thanks so much. Now, where did that chicken go? I loved your attitude and outlook in the interview and wish you all the success possible on the platform. 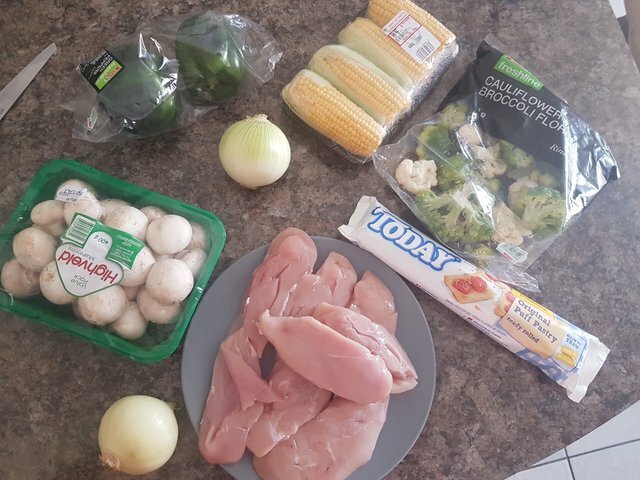 I have taken the foodies under my wings and if you find any new comers you can send them my way to @steemkitchen to join our community discord. Your visit is so much appreciated. I will definitely send foodies your way. I have actually be watching people with the #steemkitchen for a while, but didn't realize it was you! So much wonderful food. Thank you so much for your kind words. Thanks for the link as well. I know what we are having for dinner tomorrow. Yay, another test for a bot. Sorry about this. Enjoy the upvote though.